Casey Stoner was the pace setter in the opening practice for the Gran Premio bwin de España today, but despite clocking the fastest lap of the day, a late front-end slip sullied his copybook. Looking to bounce back from disappointment in Qatar where he suffered a similar spill, the Australian led for virtually the entire session, setting his fast time of 1’39.731 on just his fourth lap on track, before sliding out at the Angel Nieto corner with two minutes to go. The Ducati Marlboro rider emerged unscathed and will continue his charge for pole tomorrow. Fiat Yamaha rider Jorge Lorenzo, who has started the past two races at this circuit from pole position, was second fastest of the session as he lapped at just over a tenth of a second off Stoner’s pace. Meanwhile, Stoner’s team-mate Nicky Hayden completed the top three times as he followed on from his impressive outing at round one by pacing at just over 0.4s off his colleague’s lap time. Repsol Honda rider Dani Pedrosa will be one of the Spanish contingent looking to make home advantage count this weekend as he seeks a vast improvement from the opening weekend in the Middle East. He was fourth in the hour-long session as he took his RC212V around at just under half a second slower than Stoner’s marker. Reigning World Champion Valentino Rossi was fifth quickest, occasionally grimacing in the garage as he found his level of comfort affected by the injured shoulder he sustained in a motocross training accident a couple of weeks ago. The Italian, who won the opening round in Qatar, placed ahead of compatriot Loris Capirossi (Rizla Suzuki) and Monster Yamaha Tech3 rider Colin Edwards. Impressive home showings from Héctor Barberá (Páginas Amarillas Aspar) and Álvaro Bautista (Rizla Suzuki) placed the Spanish rookies eighth and ninth respectively in the order of times, after both had experienced minor crashes; Barberá after just ten minutes and Bautista in the latter half of the session. Marco Melandri (San Carlo Honda Gresini Team) completed the top ten, hoping to make up for the disappointment of finishing thirteenth and last in the curtain raiser with Ben Spies (Monster Yamaha Tech3), Andrea Dovizioso (Repsol Honda) and Randy de Puniet (LCR Honda) next on the timesheet. Hard-charging home-rider Alex Debón (Aeroport de Castello – Ajo) was the fastest rider in what is quickly becoming an ultra-competitive Moto2 class. The experienced Spaniard, who started the 250cc race from pole here last year, lapped the circuit nearly half a second quicker than anyone else, stopping the watches at 1’44.419. A multitude of riders challenged for the fastest times as the pace picked up, with former 125cc World Champion Gabor Talmacsi (Fimmco Speed Up) eventually emerging as the best of the rest in second spot, ahead of impressive American Kenny Noyes (Jack & Jones by A. Banderas) who is familiar with Jerez after his lengthy stint in the Spanish national championships. Former MotoGP rider and GP winner Yuki Takahashi (Tech 3) was fourth as he looked to make up for his crash in Qatar, with another Spaniard Sergio Gadea (Tenerife 40 Pons) behind in fifth. Colombia’s Yonny Hernandez wowed the crowds as he slipped and slid his Blusens STX BQR machine into sixth spot, with Julian Simón (Mapfre Aspar), Claudio Corti (Forward Racing), Tom Lüthi (Interwetten Moriwaki) and Jules Cluzel (Forward Racing) completing the top ten. Pol Espargaró made sure that he secured the early psychological boost in the first practice session of the 125cc class, leading an all-Spanish, all-Derbi top three which was almost a second faster than the remainder of the field. Posting a super quick time of 1’47.327 on his 20th and final lap of the session, Espargaró was nearly a second quicker than Julián Simón’s 2009 pole position time, and was followed by Marc Márquez (Red Bull Ajo Motorsport) and Tuenti Racing team-mate Efrén Vázquez, who were 0.121s and 0.247s respectively further down the timings and the last two to get under the 1’48" mark. 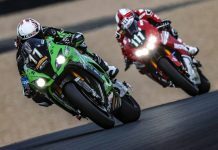 Another rider on Derbi machinery, Sandro Cortese (Avant Mitsubishi Ajo) was fourth fastest with the race winner from the opening round in Qatar Nico Terol (Bancaja Aspar) maintaining a predominantly Spanish theme in the fastest times as he slotted in at fifth. Esteve Rabat (Blusens-STX), Bradley Smith (Bancaja Aspar), Alberto Moncayo (Andalucia Cajasol) and Jasper Iwema (CBC Corse) were all inside the top ten lap times in the session.